Several years ago, when our son Jamie was two years old, he loudly announced to me that there was something with a tail in the family room downstairs. Since the only tail-bearing animal was our dog, I feared something was quite amiss. I quickly got a large flashlight and grabbed Gunter. I figured he was a powerful, large german shepherd weighing 120 pounds and would protect us to the end. After all, that's what a german shepherd does. As Gunter and I proceeded to look into a closet where the culprit was seen, a huge, black rat ran out and went behind the couch. To my amazement, not only were my two young boys screaming as they ran upstairs, but my good boy Gunter was running right behind them leaving me alone to fight the rat. I pushed the couch aside and began to beat that hissing rat with the flashlight I was carrying. It was just a wonder the police were not called since I was screaming on top of my lungs with every hit. When the flashlight literally fell apart I stopped as the rat lay still. I don't know if I knocked it out or killed it, but I quickly got a shovel and threw it into a nearby sewer. There was no way the rat was going to spend the night in my home. It had gotten into the house when my garage door was open. When things settled, I decided to have a talk with my buddy, Gunter. How could he dessert me in my hour of need. Was he the only german shepherd that did not protect his master? 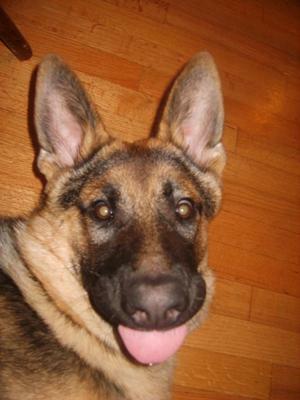 Several years later, after my beloved Gunter passed, and we had a new female shepherd, I was reading that german shepherds are a herding breed. No wonder Gunter didn't go after the rat, I thought. His breed isn't designed to be a ratter. What did I know. He was my very first dog. In hindsight, I should have borrowed my neighbor's Yorkie!